Ultraxis offer a complete range of IT services, be it complete application development or services that include Big Data and cloud computing. 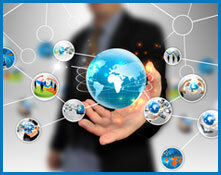 Each track lead at Ultraxis has more than 20 years of expertise in the field of IT services and software development. We have held leadership and architect roles with proven track record in the organisations such as IBM, Oracle, Cisco Systems, SAP, Sun Microsystems, Invidia, Symantec etc,. Engineers at Ultraxis have expertise in wide range of technologies such as Web Application Development, SOA and Application Integration, Analytics, Cloud Orchestration and Devops, Software QA. Our engineers work very closely with the clients and come up with innovative solutions so as to achieve the client’s goals. We have stong experience working in USA, UK and India.